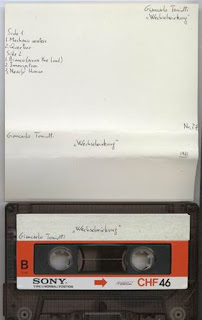 Giancarlo Toniutti was an actual 'trained Composer',studing electronic music at the Conservatoire in Venice between 1982-1985 under Alvise Vidolin.During this period there were a lot of Italians making self released cassettes in the recently formulated 'Industrial' stylee, like Maurizio Bianchi (M.B.) and the late Pierpaulo Zoppo's Mauthausen Orchestra.So, naturally Giancarlo obviously thought it'd be a good idea to get his work 'out there' with a few self-released cassettes.Although his work is decidedly bordering on the Electro-acoustic/Drone side of things,i'm sure we can lump it in with his more extreme compatriots.Yep, i'm comfortable with that. Apart from cheesy house music, there are two areas that Italy took to like a fish to water,and never tired of;one being symphonic Prog Rock,and the other seems to have been Industrial.They were in there at almost the year zero of the genre,and continue to produce some uncompromising work.Their tanks may have been built with five reverse gears and their national flag regularly exchanged for a plain white one, but when it came to extreme music they never stopped advancing into enemy territory,and for once never swapped sides. "Mechanic waters - interaction between 2 musical segments, each of which put on a channel of a stereo system. Quertanz - interaction among 3 different rhythm segments. Bianco (across the land) : interaction between 2 different sequences of notes of the same length. Innenspitzen : interaction among 4 different repeated beats segments. Nearly Human : interaction among 5 different segments of voice. Recorded at home: 1.15. 6. 1982"
DOWNLOAD some proper well-qualified compositions HERE!